The Take-Home edition is designed to stimulate parental involvement. 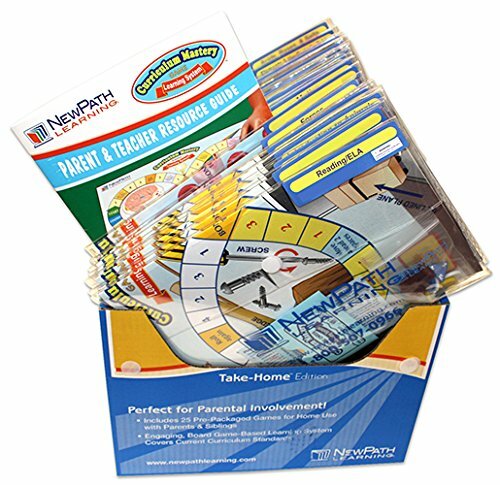 Each Take-Home version includes 25 individually packaged games; Teacher & Parent Planning & Resource Guide; and FREE 1-Year Premium Subscription to NewPath's Online Learning Program providing access to Language Arts games, interactive activities, quizzes and more. Every game is individually packaged in a vinyl folder and features a set of 30 standards-based review questions, a double-sided game board and materials for up to four students. Provides comprehensive coverage of the following curriculum topics – Author's Purpose; Capitalization; Dictionary Skills; Expository Text; Figurative Language; Kinds of Sentences; Letter Writing; Listening & Viewing; Modifiers-Adjectives; Narrative Text; Nouns; Parts of Speech; Process Writing; Pronouns; Punctuation; Reading Graphics; Reading Process; Speaking; Spelling; Structural Analysis; Study Skills; Subject & Verb Agreement; Usage; Verbs; and Vocabulary. If you have any questions about this product by New Path Learning, contact us by completing and submitting the form below. If you are looking for a specif part number, please include it with your message.